Mashed potatoes are as American as apple pie and fried chicken. Like those other staples of home cooking, mashed potatoes can be tricky to master. What you need to remember is to not overcook, not overmash—and choose the right potatoes. The best potatoes for beginners to mash are “dry” potatoes usually used for baking, like Idaho potatoes. These spuds have a lower water content than the waxier varieties, which are best used for salads. Don’t overcook. Remember that while the uncooked potato is often hard like a rock, it’s built more like a sponge with countless starch cells inside. Overheat the potatoes and the swelling starch cells will burst – making for a gluey, gummy mess. Cook the potatoes at what’s known as a slow boil, about 185 to 190 degrees Fahrenheit. The water will bubble, but softly and more slowly than a full boil. Drain the cooked potatoes thoroughly to remove as much excess water as you can. Mash the potatoes slowly and carefully – too much agitation will cause the starch cells to rupture. Peel and rinse the potatoes. Cut into quarters. Put the potatoes in a 3-quart pot and cover with cold water by about 1 inch. Cover the pot and bring to a full boil over high heat, about five minutes. Always start the potatoes in cold water. Bringing the potato and water to a boil together helps prevent the starch from leaching out of the potato cells. As soon as the pot reaches the boil, lower heat to medium and reduce the boil to a slow boil. Cook the potatoes for 35 to 40 minutes until fork tender, which means a dinner fork jabbed into the potato encounters no resistance. In the meantime, pour 2 cups of heavy cream into a small 1- or 2-quart saucepan. Add ¼ pound or 1 stick of butter and cook on low heat until the cream warms and the butter melts completely. Do not boil. Using a towel or oven mitt, take the pot of potatoes from the stove and empty into a colander placed in the sink. You'll see lots of steam rise up - let it go, the steam is taking some of the water out of the potatoes. Some professional cooks, so intent on a dry spud, place the cooked potatoes on a cookie sheet and stick in a preheated 300-degree oven to get rid of the water. You'll know the potatoes are ready to mash when the steam begins to subside and the edges of the potato quarters begin to look dry and rather white. Some people prefer their mashed potatoes passed through a ricer or a food mill for a smooth velvety paste. 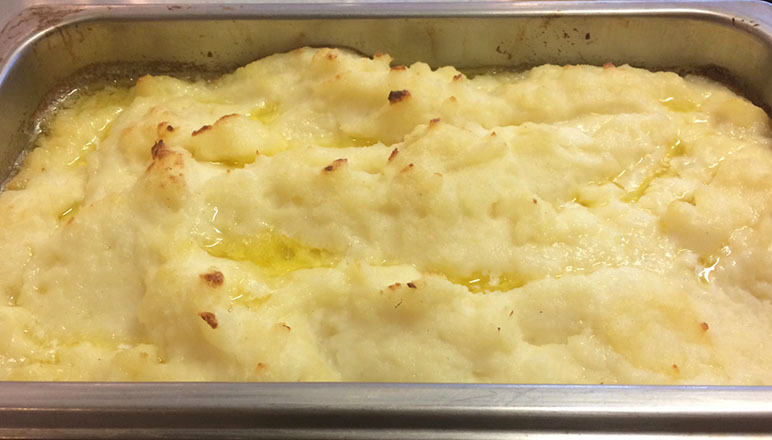 We like our mashed potatoes more rustic. Lumps? Lord no, but we like mashed potatoes with some texture, texture that means homemade. The best way to achieve this is with an old-fashioned potato masher. You just move the masher up and down, crumbling the potato into ever-smaller pieces. Potato mashers can be found everywhere, from fancy kitchen supply shops to hardware stores. Buy something sturdy, with a comfortable wooden handle. If your pot is big enough, mash the potatoes in it. Or, use a large, wide bowl. Place the quartered potatoes in the pot or bowl. Sprinkle in 1 tablespoon of salt. Place the pan with the warmed cream and melted butter close to the potatoes so you can reach it easily. Take your masher and go once, gently, around the bowl or pot to break up the potatoes. As the potatoes crumble, they should look as flakey and fluffy as new snow. Pour in roughly ½ cup of the butter and cream mixture. Go around the bowl again to incorporate the cream mixture into the potatoes. Add a second ½ cup of the cream mixture. You want to add the liquid slowly; pouring it in all at once would mean sticky mashed potatoes. Remember, the potato is still releasing steam and looking for any moisture to absorb. You provide that when you add the cream mixture ½ cup at a time. Once this second ladle of cream is absorbed add the third and finally the fourth ½ cup. You want to mix in a total of 2 cups of the cream and butter mixture into the potatoes. As you mash, push the masher slowly to the bottom of the bowl or pot and then drag it slowly toward you to incorporate the cream in the potatoes. Don't mix hard, you don't want the starch cells to burst. After you pour in the fourth and final ½ cup of the cream mixture, take a large spoon and slowly turn the mashed potatoes over once or twice to make sure the mixture has been fully absorbed. Taste carefully and sprinkle in more salt if necessary. You want just enough salt so you can taste it just under the sweet flavors of the cream and melted butter. Store any remaining butter or cream to use in reheating any leftover potatoes. Serve mashed potatoes immediately. Variation: To make garlic potatoes just add cloves of roasted garlic at the end. To make lobster mashed potatoes add a generous amount of cooked, diced lobster meat at the end. And, to make Faith's Brown Butter Mashed Potatoes: Follow Chris’ instructions, except brown the butter on the stovetop until it’s golden and smells like hazelnuts. Pour it into your mashed potatoes with 3/4 cup of buttermilk and mash it the way Chris does. It’s killer! (Inspired by The Smitten Kitchen Cookbook). On your show, it was mentioned that the mashed potatoes can be made a day ahead, which might improve the drying out and therefore more absorption of butter/cream. Can you comment on this? I ask because we’re hosting a large group and trying to make ahead as many dishes as possible. Thanks. Hi Rich. Yes. . .by all means make the mashed potatoes ahead. Let the potatoes dry out completely after they cook, meaning move them around a bit and let all that steam escape. Let them sit for a bit. Add the butter and cream, mash, and store in the fridge overnight. They’ll keep just fine. What’s the best way to reheat the next day? And should I add more cream? Hello! To reheat, Chris recommends putting the mashed potatoes in a casserole dish and baking at 350˚ or so for a few minutes, just until lightly browned on top and toasty warm. And, no need to add more butter or cream (unless you think they absolutely need it). Hi Geoffrey. See Chris’s answer to Aileen. Happy Thanksgiving! 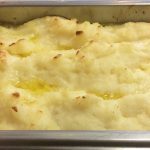 What is best method to reheat the previously made mashed potatoes ? Thanks for writing in, Diane. Others had the same question: see Chris’s answer to Aileen. Happy Thanksgiving! Okay, but then how do I reheat? Reheating is a cinch: see Chris’s answer to Aileen. Happy Thanksgiving! We never cook for more than 15 after a boil, anymore time more than that it will become way too soft. What can we say, Chris likes an almost-falling-apart potato for his mash. And, keep in mind, after the initial boil, it’s a rolling simmer the rest of the way. I like skin on my mashed potatoes. Does this change anything in regard to the recipe? I love a rustic mashed potato, too. Go for it! You’re so very welcome, Winnie. Thank you for listening! To Rich’s question – how do you reheat the potatoes the next day? Hi Mary Ann. It’s easy. . .see Chris’s answer to Aileen. Happy Thanksgiving!